The Value of The Perfect Single Shot Fundamentals Development Class by Ruslan Dyatlov. IZH-46M, You can buy today for $600-$850 (with a custom grip). 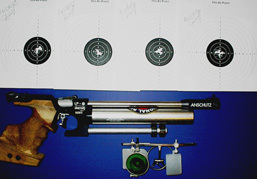 First practice after cleaning, oiling, trigger weight adjustment by ISSF rules, with special modifications by MATS. One of the top-priced compressed Air Pistols on the market + Air Pump = $1,600 combined price. Results: Price Difference? $1,000.00 Score? Evidently, not a very significant divergence in score is visible on the targets. So now that we know what the Real key to improved performace is NOT, it is worth considering what it in fact IS. Yes, it is true that the newest, state of the art, high quality equipment will help you gain an edge, or at least compete at the same level plane with the world’s top pistol shooters. However, this factor is not very significant for beginning or intermediate athletes. The only time when these factors come into play is at advanced world-level competition. Before reaching this level, however, an aspiring Olympic Style Pistol shooter must put in the time and effort to do what is necessary to get in the right state of mind, with the right skills and knowledge to compete at an international level. 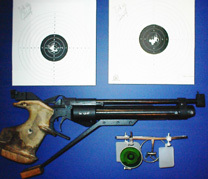 Before SPENDING money on expensive guns and accessories, all shooters would be well-advised to first INVEST some time and thought into obtaining a better fundamental understanding of the PERFECT SHOT, the basic foundation of a consistently successful performance. There is one important fact that all ambitious and goal-oriented pistol shooters must realize. In this business you cannot BUY results, you must work on obtaining the skills and knowledge to EARN and ACHIEVE them. For this reason, at Midwest Academy of Target Shooting, we look at every individual client and examine his current performance, revealing precise problems in his technique. Since everyone has a different set of problems, we do not just give you a set of rules and hand you a certificate. We explain exactly where your shortcomings are and work with you to fix problems, increase knowledge, and improve results on an individualized person to person basis. If you are stuck at a certain level and you don’t know why, you should seriously consider what you have been doing to try to improve your performance and whether it is congruent with what you have learned here. It doesn’t matter if it’s 420, 480, or 560. Until you can make a solid 600 in a competitive situation, there is always room for improvement. If you believe that you do not yet have the necessary fundamental knowledge to achieve the goals you have set for yourself and become successful in this sport, it is best to get it now, before promotional price equals market value. …And see the results you deserve! If you are interested in competing at and representing your country at international tournaments, feel free to learn about our High Intermediate and Master Level Courses as well!